Fuelled by Norwegian KitKats and chasing a Kodak moment, Scandinavia Specialist Mark took on the epic day trek to Trolltunga. 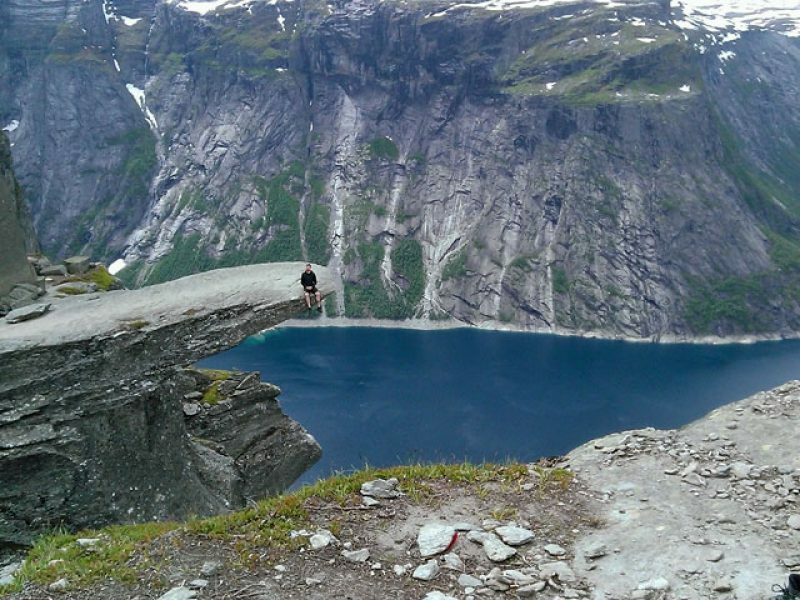 Located at the end of an 11km walk from the car park at Skjeggedal near Tyssedal in Fjord Norway is Trolltunga – the ‘Troll’s Tongue’. This spectacular rocky outcrop was left behind by glacier movement at the end of the last Ice Age around ten thousand years ago. These days it sits above Lake Ringedalsvatnet and attracts thousands of visitors between mid June and mid September during the brief three months that the trail is open. To make the journey you need to take a water bottle, some lunch and a few Kvikk Lunsj – these are similar to Kit Kats but in Norway are taken on family hikes for energy boosts. The long walk starts with a steep scramble along a rocky track up through the tree line. This levels off after about a kilometre to limestone bedrock that makes up the rest of the trail. Each kilometre is marked by a sign showing the distance in either direction. Volunteers from the Norwegian Trekking Association have also spray-painted red letter ‘T’s along the way to help walkers follow the track. These red ‘T’s are commonly found along hiking paths in Fjord Norway and have been left to make hiking safer for everyone. At about six kilometres into the trek I had my first spectacular view of the lake far below the horizon. To say that the view is stunning is an understatement. 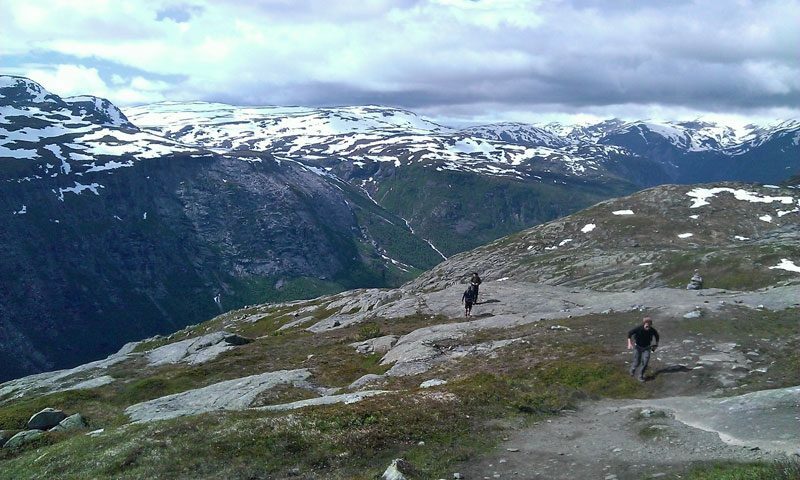 Everything feels free, clean and pure up here and the walk feels worth it even though Trolltunga is still out of view. After walking nearly three and a half hours we knew we were getting near Trolltunga as there were lots of people sitting and looking toward the horizon. After the final walk across the tectonic plateau we were greeted by the famous Troll’s Tongue. What a sight! We climbed down the last small rock face by a metal ladder drilled into the rocky wall and waited for our turn to walk out to edge. We took it in turns to take photos of each other doing triumphant poses for Facebook and for the scrap book. Some people were dangling their legs over the edge and others were making shapes and pulling poses. Whatever they were doing they were having their own Kodak moment. After eating our well deserved lunch, we wound our way back down the path. The walk back felt a little slower than the way up, but what a journey! I now have the bug and want to walk up the nearest hill just because I can. Fantastic! Trolltunga juts out over the southern branch of Hardangerfjord, high up in the Jondal municipality above Odda in Fjord Norway. 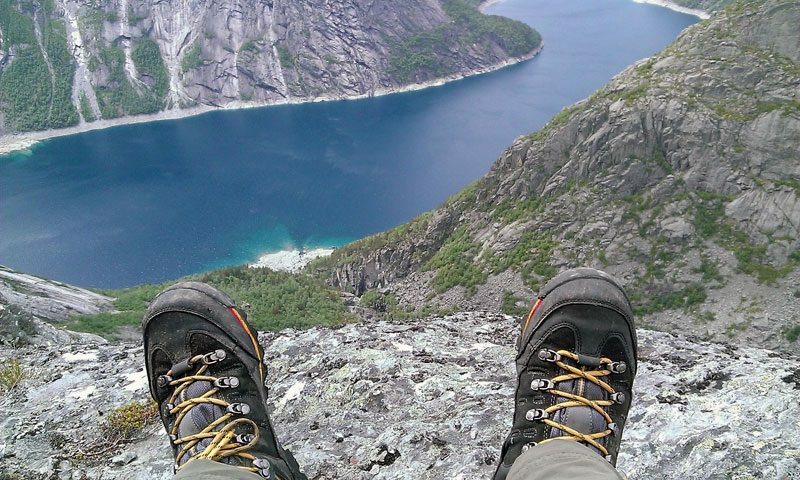 Discover more about all our walking and hiking holidays in Norway.